George Barris grafted the front end of a ’29 Model A Ford to the stern of a ’27 Ford Model T to create what the Oakland Roadster Show dubbed “America’s Most Beautiful Roadster” two years in a row (1958 & 1959). 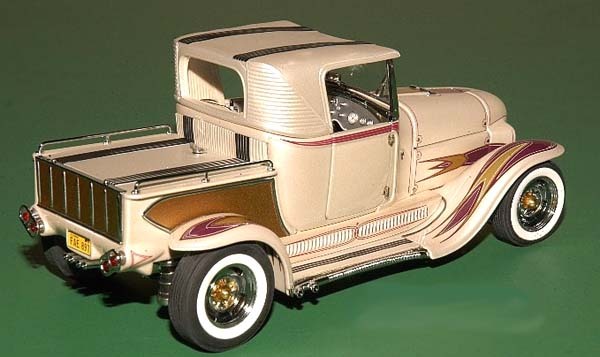 DM’s 1:24 scale image of the Ala Kart is a small one – for the original roadster is a small car. And what a little jewel it is. It’s hard to believe the amount of features and stylistic flourishes that are packed into such a small vehicle. 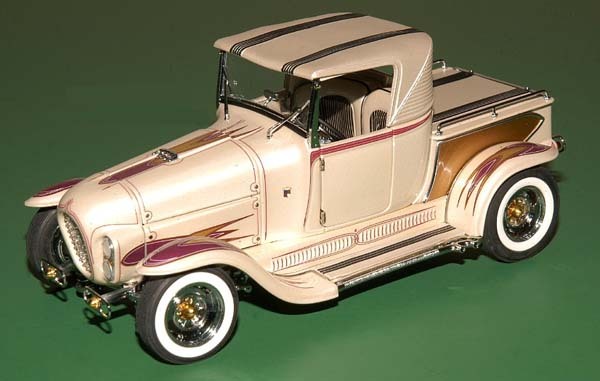 Barris maintained the overall “look” of the original Fords but seemed bent on adding modern touches like quad headlights, canted, raised taillights and a molded radiator shell surrounding a custom grill studded with Lucite rods. To a Swedish Pearl paint job, Barris added gobs of chrome above and below, with purple and gold scallops and pinstripes everywhere. Pleated Naugahyde was used for the upholstery and convertible top – and was even used on the undercarriage! DM has recreated this stylistic UN faithfully in 1:24 scale. Features include a full working suspension, a three-piece, removable hood and an exquisitely detailed scale replica of the Hilborn-injected Dodge Hemi engine. It makes you smile just to look at this little gem of an image. The models in this collection are in excellent to near-mint condition. They were purchased directly from Danbury Mint and other secondary sources, then placed into enclosed display units. We needed to perform light detailing on some models to make them showroom ready. Most models did not include titles or care instructions, but we'll include them if we have them in our library. The overall condition of the boxes is fair condition for older releases, and excellent to mint condition on newer releases.